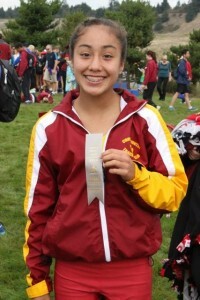 Despite her rigorous swim schedule, Reyes joined the varsity cross country team at CHS this year. The challenge – two fall sports, three practices, all while handling her first year of high school. To Naomi Reyes, it’s just daily life. A lifelong competitive swimmer, Reyes also decided to turn out for Capital High School’s cross country team this year. “I’ve always liked running and I wanted to try something new,” she says. While some athletes may have chosen to put swimming on the shelf for a season, Reyes instead decided to do both. Every Monday, Wednesday, and Friday, she heads to the pool before school from 5:30 a.m. to 7:00 a.m. She then attends CHS, runs during cross country practice from 2:45 p.m. to 4:45 p.m. and then is off to the pool again from 5:00 p.m. to 7:00 p.m a couple nights a week. Capital High School freshman Naomi Reyes swims competitively with The Evergreen Swim Club. Her swim coach, Randy Trowbridge, isn’t surprised. “She never backs down from a challenge. She’ll go after it. She’s fearless,” he shares. Swimming comes naturally to Reyes. She’s been doing it since she was three, and competitively since age eight. She swims for the Evergreen Swim Club. Right now she’s training to make PNS champs times and regional cuts. Reyes competes in the 100 and 200 breaststroke, and distance freestyle. One event, the mile, is 66 laps in the pool. Having to swim that far requires a lot of endurance, and that quickly translated into running. Trowbridge agrees. “She’s the smallest person on the team, but she’s one of the biggest parts of it because she’s a leader.” Whether that’s taking on a challenge or cheering for others, she’s a valuable part of both teams. “Naomi understands what work ethic is,” cross country coach Kevin Wright explains. “We needed someone like her to come in.” She consistently pushed herself and her teammates throughout the season. Capital’s team finished tenth in 3A state, while they had previously been classified as a 2A team. “She works hard, she doesn’t give up, and she gives it her all in every single race,” says teammate Inanna McCarty. Her cross country races are 5Ks and her personal record is running a 19:26. She’s the second fastest freshman coach Kevin Wright has ever had on his team. As the number two varsity runner, Naomi recently competed in 3A state, taking 33rd. 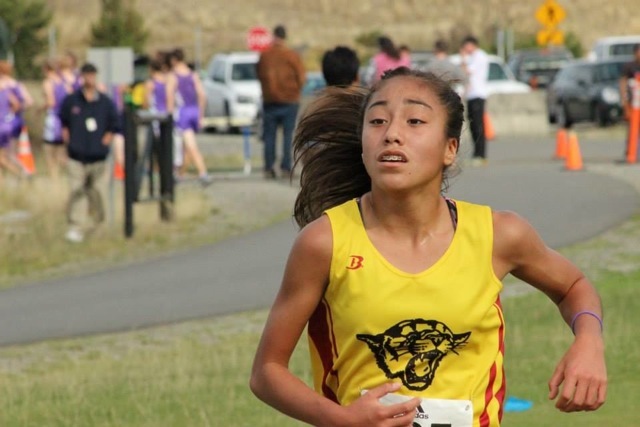 In her first year running cross country, Naomi Reyes made it all the way to WIAA 3A State competition. Fellow varsity athlete Marin Farrell adds, “She doesn’t look intimidating, but when she runs, people get scared.” Reyes was a very competitive racer, placing fourth in districts and second in league. She didn’t let the fact that she was a freshman intimidate her. In the state meet, there were only two other freshman ahead of her. With three more seasons to grow and improve as a runner, Reyes has a bright future. “She has high expectations and high goals. I wouldn’t put anything past her,” says Wright. The same goes for swimming, and Reyes has already seen improvement in the pool since she started running. “I can feel myself being able to kick stronger and faster,” she says. For her, all the hard work and time was worth it. “It was pretty chaotic the first couple of weeks, but once I progressed and got used to it, I was so glad I stuck to it,” Reyes explains. Swimming and running are two very different sports, but both are physically demanding and extremely rewarding, too. At the end of one of her crazy busy days, she is glad she can peruse both her passions. Because of her determination, and fearlessness, she worked hard throughout the season and pushed herself and her teammates. But Reyes is not done yet.